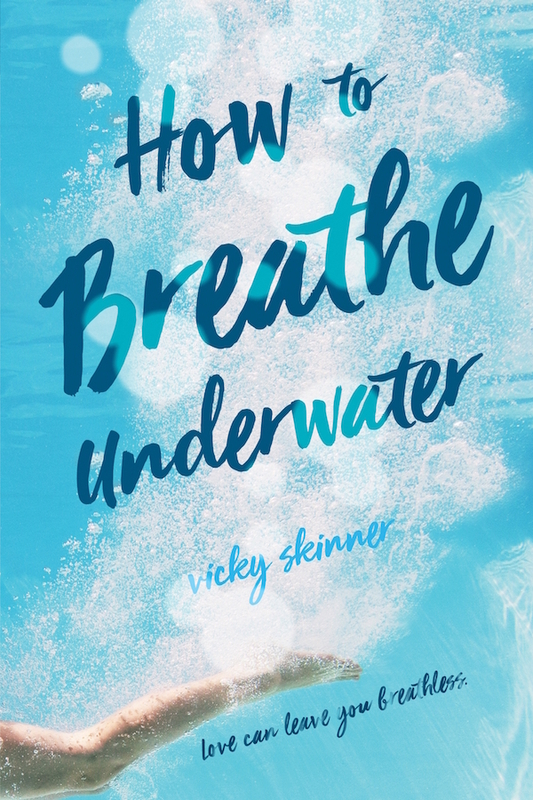 I’m in the middle of reading How to Breathe Underwater right now, which I am loving, so I am beyond excited to have debut author Vicky Skinner on the blog today! I love that the book features the sport of swimming, so I asked Vicky to touch on her inspiration and research she did on it while writing the book. When I tell people that I wrote a book about a swimmer, I almost always get a question like this in response: “Oh, are you a swimmer?” or “Did you swim in high school?” or “You think you can beat me in the pool?” (That last question brought to you by the youth pastor at my church, who was ready to videotape the race). When I tell them the truth, it often makes the smile on their face turn to confusion. So, I’ll just get the truth out of the way now. Like Michael, the cute boy across the hall, in HOW TO BREATHE UNDERWATER, I can mostly only doggy paddle. Swimming is just never a skill that I learned as a child, and it’s a skill that only gets harder to master the older you get, and since I’ve never had a pool of my own, I’ve never had much opportunity for practice. So why, you may ask, would I write a book about a sport I can’t even come close to participating in? Because swimming is amazing, and there aren’t enough people writing about it. Let’s just go back 14 years (no comments on my age, please) to when I was 13, in middle school, and watching my very first summer Olympics, the Athens Olympics. I had my eyes glued to every single sport, but it was swimming that really got my attention, and specifically, Michael Phelps. Now, this was not Michael Phelps’ first Olympics, but it was the first Olympics where he won a medal, and I was obsessed. Not just with Michael but with swimming, with the Olympics, with all of it. Water was something that terrified me as I’d almost drowned at a Surf N Swim as a child and had never really recovered, but this was the first time I’d ever seen swimming as a sport, and it blew my mind. Those swimmers did things with their bodies that I couldn’t even imagine existed before that moment. They were focused and talented and fast. From then on, I studied the sport. I followed Michael’s career, I learned everything I could about swimming, I might have even tried to date a boy in middle school because I was obsessed with the fact that he was a swimmer and that he shaved his legs for the sport. But the first time that it occurred to me that I might want to write a book about swimming was when I was in college. Back then, HOW TO BREATHE UNDERWATER was just a book about a girl who had an incident at the beach and was now terrified of water. But after I read Michael’s memoir on his time at the Athens Olympics, I knew I wanted to dive deeper (believe it or not, that’s the first swimming pun I’ve made during this whole process!). That’s when Kate’s story was really born. Even though I could wax poetic about splits and dolphin kicks and flip turns, I don’t actually talk about swimming that much in the book. Kate quits the team early on, and most of her time with the pool on the page happens in the past or is just for recreation, but I could talk about this sport frontwards and backwards, just drop me a line! If you’ve never watched swimming, it’s a sport that is so technical, so precise, and so beautiful that if you see it up close, you might not be able to look away, and maybe you’ll love it as much as I do! Don’t forget to check out the other tour stops! I can’t wait to see your review on this book. I’ve had it on my TBR for months and can’t wait to read it! I hope you’ve had a chance to read it! Definitely one of y favorite books of the year. I’m not usually into sporty books, but this sounds like something I could get into! Great guest post! It’s definitely not super sporty, so it definitely might be something you’ll like!